I love a good brioche. When I was in Paris, my hostess Mme Bastié used to buy this packaged brioche (brioche tranchée nature) from Monoprix (the supermarché extraordinaire) for my breakfast. It was bright yellow, buttery and eggy, and so soft that I could squish very generous amounts into my mouth at once. I ate it every morning spread thickly with this unbelievably tasty, crunchy, sea-salted butter. Surely, this preservative-laden treat was the French equivalent of Wonder bread, but it was good. Very good. Even better slathered with said butter and dipped in Nescafé au lait. I imagine Mme Bastié and her friends would scoff at my barbaric American taste, eating (scarfing) brioche from the Monoprix. But it was a cultural novelty to me, and I love culture- especially spread with butter from Normandy. 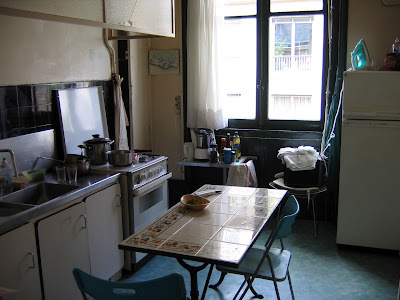 La cuisine de Mme Bastié in the 7e (Paris), where I spent the summer of 2005. A few years after, I still remember the taste of that brioche, and have searched high and low for an equivalent to no avail. So I resumed making my own (I used to make it at La Sardine when I worked there), and I think it is quite delicious. This recipe has been adapted from Anne Willan’s book, The Country Cooking of France, but I have adjusted the recipe to make it softer, butterier, and eggier to suit my taste. Makes two loaves. Soak the yeast in the warm (not hot) milk for about five minutes. Add all dry ingredients to stand mixer bowl (see * for instructions on making by hand); mix on low for one minute, or until the ingredients are mixed and a well is formed in the center. With the mixer turned off, pour the egg/milk/yeast mixture into the well. Mix on low until the dough comes together, then continue mixing on medium-low for about ten minutes (until the dough is smooth and shiny). If the dough is too wet, add extra flour (one tablespoon at a time) until the dough is elastic and smooth. The sides of the bowl should be clean. Cover the dough and let sit until it doubles in size. Once the dough has doubled, put the bowl back on the stand. Turn the mixer on low and slowly add the butter bit by bit until it is all incorporated. This takes awhile, so be patient! While the dough is mixing, use the butter wrappers to butter two loaf pans very well. When the butter has been incorporated and the dough forms a ball, stop the mixer. Take the dough out of the bowl and knead it on a lightly floured counter until it is again smooth. Cut the dough in half, and form into two loaves. Put one loaf in each pan. Pre-heat the oven at this time to 350 degrees F. Let the loaves rise in their pans until they are doubled. Brush the tops of the loaves with egg wash, and bake until golden brown (in my oven, about 30-35 minutes). Cool on wire racks, and do not cut until completely cool. * If you want to do this by hand, you are a glutton for punishment. I refuse to enable you. Can I make just one loaf? Can I add cheese, bacon, or anything else to the brioche? Why, you are brilliant. Yes- do it, and send me a picture! May I use egg substitute or margarine? Why would you want to do that? Enjoy a little!